Do you have a problem with heating and cooling costs, loud noise, window condensation, or do you just want to be comfortable in your own home? Castle Window Covers has the solution. 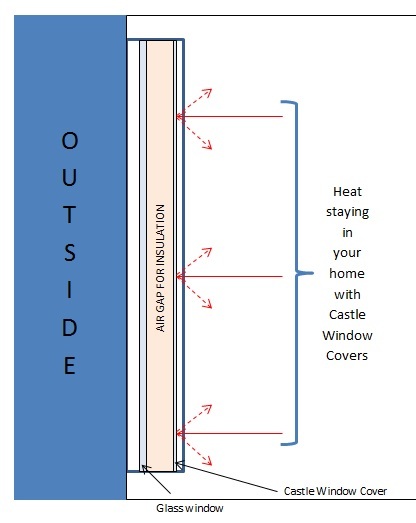 We help soundproof your windows while also keeping the temperature in your home comfortable all year long. Whether you have arch windows, classic single-pane windows or odd-sized, custom windows - or even if you want better soundproofing, Castle Window Covers has a Better Fit for your home. Castle Window Covers serve a dual purpose: window soundproofing and window insulation to keep the temperature comfortable in your home all year long. Our insulating window covers are virtually invisible and they soundproof your windows by up to 70%. They also maintain the temperature in your home by eliminating cold drafts in the winter and preventing cool air from escaping through your windows in the summer. All in all, Castle Window Covers keep you comfortable all year long by soundproofing your windows and keeping your home's temperature right where you want it in hot or cold weather. 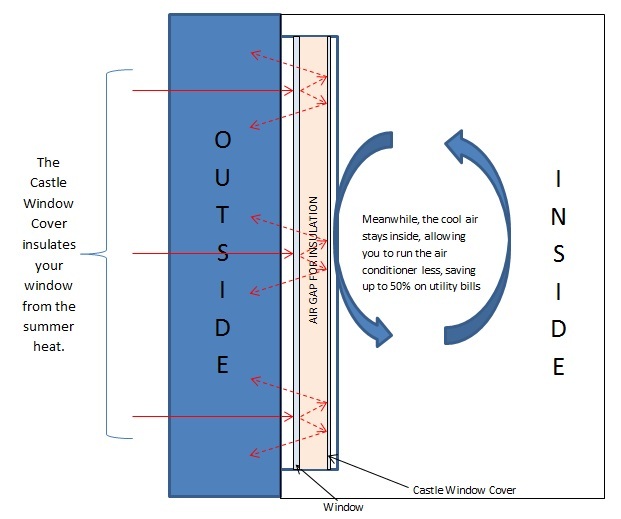 See the graphics below for a quick reference on how Castle Window Covers insulate your windows from sound, heat and cold. Watch Anthony Melchiorri of the Travel Channel's hit show, Hotel Impossible, explain why he loves our soundproof window system. ﻿We've been doing this for a long time, and this video proves it! This is what happens to the warm air in your house in the winter. When your heater is on, your money goes right out the window! With insulated windows from Castle Window Covers, you'll see the warm air stays in your home in the winter, helping you save up to 50% on heating costs. 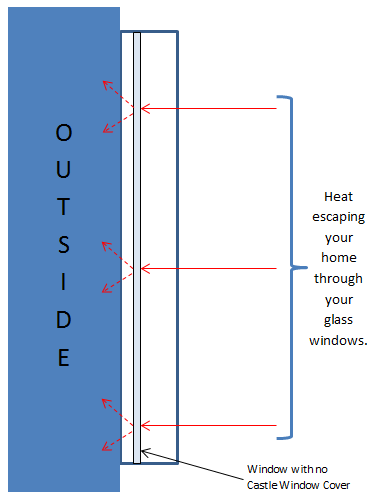 In the summer, the heat comes in through your glass windows if your windows aren't insulated. This heats up your home, keeping your air conditioner on all day with poor results. With Castle Window Covers, your windows are insulated, keeping the hot summer heat out while keeping the cool air inside. This also helps you save up to 50% on cooling and utility bills. Soundproof your windows by up to 70%. Call us with any questions or for a free estimate for any window soundproofing or heating and cooling needs. We serve all of California with products and installation, and we may even be able to help you all across the country. Give us a call at 209-465-3200, or email us with your questions HERE. There's no need to replace your windows. 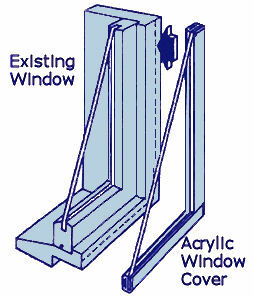 First, we install a small, unnoticeable metal frame on the inside of the edge of your window. Next, we custom-fit our acrylic window cover to the size of your window, and fit it with an industrial-strength magnetic edge. After that, we simply "snap" the insulating acrylic window cover right into place over your existing window., helping to soundproof your windows and keep your utility costs to a minimum. Castle Window Covers are virtually invisible and are a breeze to put up and take down. Best of all, they insulate your windows better than most dual- or even triple- pane windows, sealing your inside temperature at a comfortable level all year 'round. This maintains the beauty and integrity of your existing windows, all for about half the price of replacement windows. Looking for blinds? No problem! We carry all the major brands... and more. Click here!